BHOPAL: Creating awareness among farmers regarding safe online transactions is essential as farmers are increasingly being targeted by fraudsters. 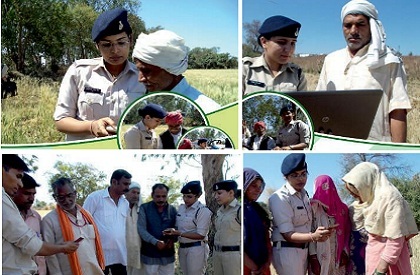 Hence, the Madhya Pradesh cyber police have launched an awareness campaign 'Kisan Connect' to inform the rural folk how not to fall prey to online frauds. The aim is that farmers who either use ATM card or Kisan credit cards, are told about cyber safety--the precautions and the steps that are needed for safe financial transactions. AIG Shailendra Chouhan says that the farmers are being told that they should not share the passwords including OTP and information about their bank account, bank pass book, Adhar card, Kisan credit card or ATM with anyone. Chouhan says that they are being told to be extra careful when some one promises investment that would double or treble the amount in a short period. Cyber cell officials say that while internet penetration is gone up in rural India, people in these areas aren't yet so aware. Hence, they need to be told about basic internet security as well as measures to guard against frauds. The cheats often make phone calls posing as bank officials or representatives of particular companies and the farmers need to know that under no circumstances the PIN or password would be revealed to anyone. Further, if there is any misuse of Kisan Credit card or unauthorised transaction in account, then police have to be informed immediately. Further, if there is online fraud, the bank has to be approached and informed immediatley. This is necessary so that the unauthorised transaction can be stopped. Kisan Connect's motto is 'Surakshit Kisan, Sampann Kisan' i.e. if farmer stays safe, he will be prosperous. The farmers are told several ways to ensure that the transactions are safe. From telling them that no one else should be in the ATM chamber when someone is withdrawing the money to ensuring that bank sends alert in case of each transaction, the farmers are being made aware about cyber security. The senior officers and field personnel are taking the help of Mandi officials to reach the farmers and create awareness.